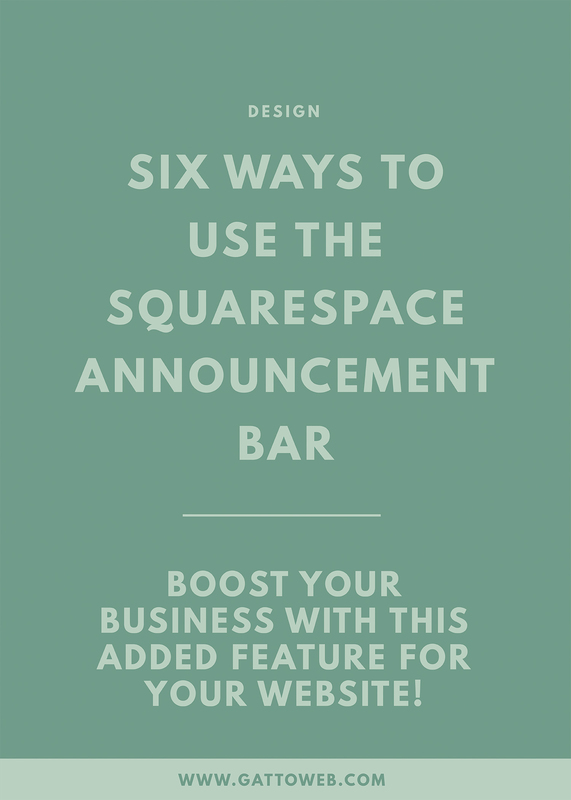 The Squarespace Announcement Bar is a great feature on all templates which you can use for various purposes. It sits at the top of your website so will be one of the first things your readers see and any important information can be added into it. You can add linked text, style the bar to match your design and it appears on every page. But how can we utilise this function in the best way possible? Below are some great ways you can use the Announcement Bar to market your business and display information. If you have a newsletter for your website or business (which you totally should by the way! ), the Announcement Bar is an incredible way to advertise this and link to a sign-up form. Most people recommend having your sign-up link at least three times on your home page and this is a really great way to add one in. You can even advertise a free opt-in if this is a service you provide as this will incentivise people to click through and subscribe! Your social media can now be a huge tool for marketing and is a great place for clients to get updates and see your latest work. In the Announcement Bar, you can include a link to either your favourite social profile using the Click through link or add a few separate links in the text area. If you are running an exclusive offer on your products, having it at the top of the page is a great way to alert potential customers. You can add the dates for which the offer is running, link to the products you are offering and even add a discount code which people can insert at checkout so you don’t have to drop the prices directly on your website. Creating excitement around a new product can be difficult on the home page of your website is your landing page doesn’t have product links. Adding a message to your Announcement Bar saying you have a new product and linking to it can get customers excited about the launch and get more clicks. Blogging is a big part of any business and it is important that it is clear you have a blog and where your posts live on your website or you may not get many views on them. You could replace the Announcement text every time you blog with the title and a link so readers know what you are blogging about and how to get to your new post. A revolutionary one, you could use the Announcement bar for… *drum roll* an announcement! I don’t know how I come up with these ideas! If you are taking a break from your business or if you want readers to know you are currently booking clients it is a great way to display this information. Now you have a bit of inspiration, how are you going to use your Announcement Bar?